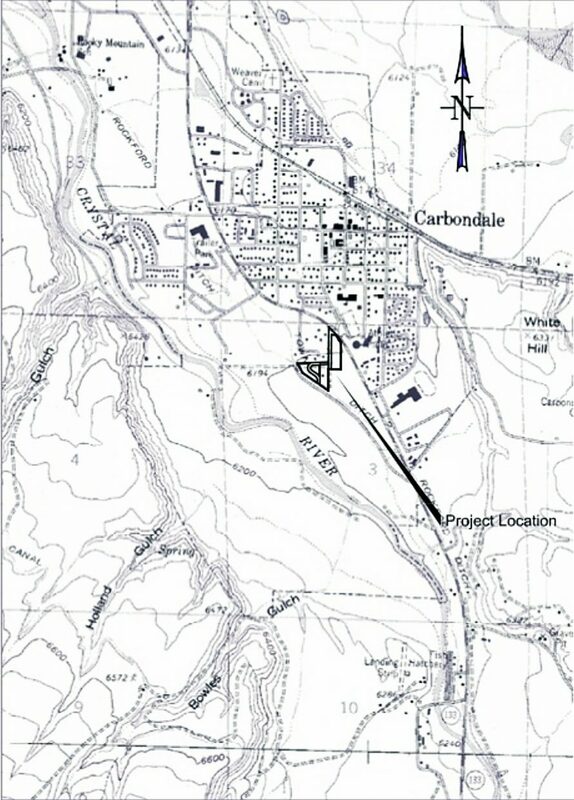 The location of the Thompson Park subdivision within the town of Carbondale. Improvements will begin on one of Carbondale’s last remaining islands of undeveloped land this month, following the Board of Trustees’ 6-0 approval Tuesday evening of the Thompson Park master plan. The original 10-acre parcel, on the south end of town between Triangle Park and Keator Grove on Highway 133, was annexed in 2012. It includes the historic Thompson House, which will be dedicated to the town as part of the process, as well as the 2-acre future site of Ross Montessori School, which the school purchased last year. Impending construction on the school site accelerated the need for infrastructure, for which Gould Construction is currently securing final approvals. Once they began, workers will have 120 days to install water, sewer, gas, electric, roads and sidewalks through the property. According to Gould, crews plan to operate from 7 a.m. to 5:30 p.m. weekdays unless weather delays force construction on Saturdays. Construction traffic will access the site from Highway 133. “We have to connect into RVR, but any construction access will not come through RVR,” Gould said. The project also requires a 50-foot construction buffer around the Thompson House. “The town was very careful to put some precautions in there to protect the house during construction,” Town Planner Janet Buck said. While the town owns the house itself, the contents were deeded to the Mount Sopris Historical Society, which has operated it for tours for several years. The question of who will manage the house long term is one of the next big hurdles for the property. “Once it’s dedicated to the town, we’ll probably see discussions begun about the future of that house,” Buck said. Cerise Park LLC plans to construct as many as 27 residential units on just 4 acres not occupied by the Thompson House, Ross Montessori or rights-of-way, but will require additional approvals to begin construction. Long before that begins in Thompson Park itself, Ross Montessori will begin to rise on the lot to the north. Although the official groundbreaking isn’t until June 3, crews plan to begin preparing the site next week, according to director of development and enrollment Tricia Williams. The first phase of the project is slated for completion in midwinter, and the school plans to move from its modular facility on Merrill Avenue shortly thereafter. Like Thompson Park itself, it’s been a long time coming. “Ten years ago, the parents who founded Ross knew they wanted to find a permanent facility,” Williams said. After several attempts to locate land and funding, Ross finally purchased the lot in Thompson Park through a U.S. Department of Agriculture’s Rural Development Communities Facilities Loan Program in September 2014. Williams said the USDA has been a solid partner. “They really want us to do well, and they want us to be strong,” she said. The school also is applying for a Great Outdoors Colorado grant to construct a playground, as well as a Colorado Office for Research Efficiency grant to install a solar array. The building itself will be two stories with room for an anticipated 10 percent enrollment increase. “We’ve been putting the word out there that it’s actually happening, and our numbers are going up because of it,” Williams explained. It includes some specialized Montessori elements, including L-shaped classrooms with room for activities. An anticipated second phase would add six more classrooms, a gymnasium and cafeteria, eliminating the need for a catered lunch. Most importantly, the school gains a permanent home in a central location, with access off Highway 133 via the newly constructed Lewie’s Lane. Buck also is excited about the school, the Thompson House and the potential for new homes in a housing-strapped community.